Don’t be fooled by this cover. The blond powerhouse emerging from the sewer in the photo is no wallflower. 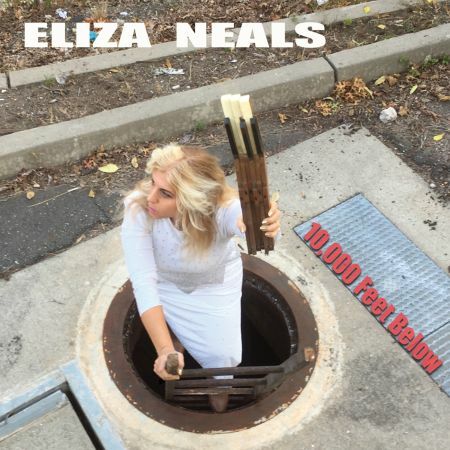 Eliza Neals is an electrifying vocalist, and she’s gathered an all-star lineup to deliver 10,000 Feet Below, an in-your-face collection of blues-rock that’s powerful enough to knock you off your feet if you’re not careful. A multi-instrumentalist who concentrates on keyboards on this one, Neals is based out of Detroit and tours the world with her band, The Narcotics, which features another Motor City blues-rock giant, Howard Glazer, on guitar. They’re joined here by Rock And Roll Hall Of Fame guitarist Billy Davis (Jimi Hendrix Band) and Grammy-winning stringbender Paul Nelson (Johnny Winter). The rhythm section includes Skeeto Valdez (Johnnie Bassett and Trey Anastasio), Demarcus Sumter, Bruan Clune, Rubin Nizri and John Medeiros on drums, and Paul Randolph, Lenny Bradford (Joe Louis Walker and Murali Coryell), Mike Griot and John Abraham, who take turns on bass. Neals contributes piano, Hammond B-3 and Rhodes keyboards and aiding the rhythm on tambourine. 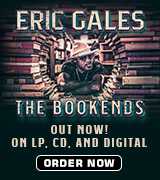 Make no mistake, however, Eliza’s the star here in a collection of ten originals and one cover that remain faithful to the blues format, but takes liberty with traditional boundaries. She possesses a voice that’s totally unique while being compared favorably by critics to Etta James, Janis Joplin and Ricky Lee Jones, among others. The action heats dramatically for “Burn The Tent Down,” a rocker that describes the arrival of a ten-wheeler in preparation for a barbeque that’s destined to be a blowout. The title tune, “10,000 Feet Below,” recounts a return from the underworld and the warning to a wrongdoer that there’s a fire waiting for him on the other side. Neals’ vocal pyrotechnics introduce “You Ain’t My Dog No More,” a rocker that tells a former lover he’s no longer getting any treats, before Nelson’s featured on “Cold Cold Night,” a slow-blues ballad about a man who never listens to what the singer has to say. The only cover in the set, Skip James’ “Hard Killing Floor,” follows with a totally new, modern arrangement, before Glazer comes to the front for “Call Me Moonshine,” a steady-driving, slow-walking rocker. Voodoo imagery returns for “Downhill On A Rocket,” about another person on a slow descent to Hell, before Eliza delivers “Merle Dixon,” apparently a tribute to a main character from The Walking Dead TV show. Another blues-rock ballad, “At The Crossroads,” features Davis and brings the action to a close. 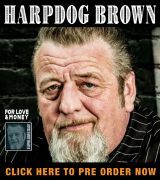 Available through Amazon, CDBaby and other major retailers, 10,000 Feet Below is never boring, and right up your alley if your tastes run to the rockier side of blues.